If your neighborhood has a starburst clerodendrum (Clerodendrum quadriloculare), also known as a “shooting star,” consider yourself lucky. 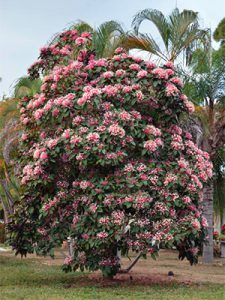 Because, although this is a gorgeous, small tree, it also is among one of the more rarely used landscape plants. The tree sports show-stopping blooms in late January to mid-February. In addition to those eye-catching flowers, the clerodendrum shows off with striking leaves, with green tops and purple undersides. 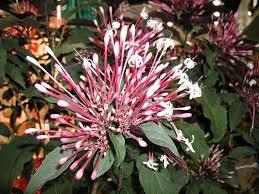 Another interesting fact about the clerodendrum: it actually is in the mint family. The starburst clerodendrum prefers exposure to full sunlight, fares best in areas with good drainage, actually is a fairly drought-tolerant specimen, and it generally does not experience major pest and disease problems. All of which makes this beauty a good, low-maintenance, “set-it-and-forget-it” kind of plant. Low-maintenance, Florida-friendly landscape plants like the “shooting star” are a gardener’s best friends, because they have fewer landscaping requirements.